Pokhara’s Waterfront Resort lies on the tranquil rural northern shore of the beautiful Fewa Lake. With supremely comfortable, air-conditioned en suite rooms, each with a lake-view balcony, it is the perfect place to relax and unwind. In the mornings, as the sun’s rays catch the Peace Pagoda above the southern lake shore, you will see fishermen paddling their boats close to the lake’s edge pulling in their nets. Mid-morning, after the sun has warmed up the land, you’ll be able to watching tens of paragliders coming into land while you enjoy a cappuccino on the terrace or lounge by the sparkling garden pool. 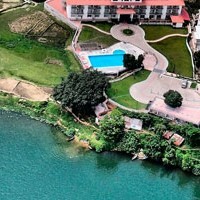 Pokhara’s Waterfront Resort is just a 10-minute ride from the airport, and just a 15-minute walk from the busy tourist hub or 5 minutes in a taxi. There’s no need to walk: the hotel provides free shuttle service into Lakeside at intervals throughout the day.